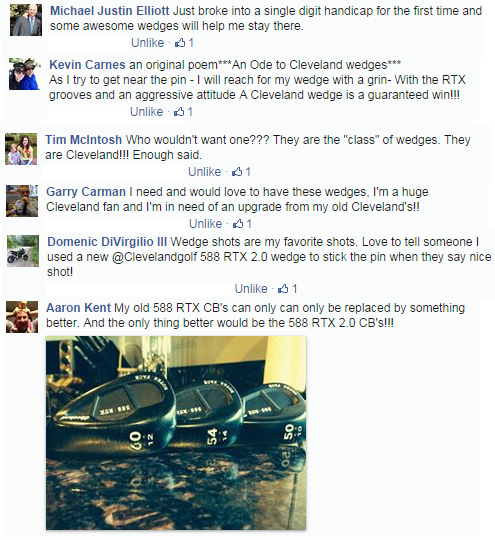 Thanks to all that participated in our Cleveland 588 RTX 2.0 wedge set giveaway. There were tons of great comments submitted and below is just a sample of the hundreds submitted. Congratulations to Kevin Carnes, these beauties are headed your way! Be sure to connect with us on Facebook, Twitter, Google+, Instagram, or YouTube so you’ll never miss an opportunity for other giveaways! You can still learn all about the Cleveland 588 RTX 2.0 wedge in our previous post.